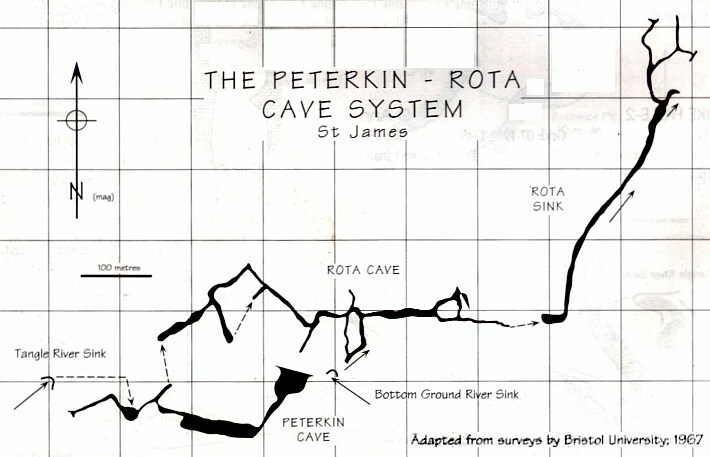 The Peterkin-Rota cave system, located near Maldon, St James, Jamaica, is the sink for the Tangle River, which rises again at Deeside Roaring River Cave, 7.5km to the east-northeast. The JCO takes small groups of visitors who are based in Montego Bay into the first two-thirds of the system, covering about 1km, and spending 3-4 hours underground. As with all of our tours, we supply helmets, headlamps, and any other caving equipment you need. Please be aware that there's a little swimming involved, so if you're not comfortable with water, this isn't a suitable tour. The system is quite interesting for both its hydrology, and biology. Species found in the caves include crayfish, troglobytic crabs, the predaceous fly larvae Neodytomia farri, and bats. The usual guide for the tour, RS Stewart, studied the site during a Nature Conservancy project in 2005, so we supply an educational component for the visit, along with adventure. The cost is 100 USD/person, with a minimum of 250$ including transport. Transport to/from the cave for up to five people can be supplied for 60 USD from Montego Bay.